Former Arizona Senator Jon Kyl has been Brett Kavanaugh’s “sherpa” for his nomination to the U.S. Supreme Court. On the eve of Tuesday’s confirmation hearing, Kyl tells Arizona’s Politics this weekend that Kavanaugh “has done a very good job in his ‘interviews'”. Kyl also says that he has not been involved in the White House’s decision-making process on which documents should be made public for the confirmation battle. In an email to Arizona’s Politics, Kyl said that that document production “is handled by White House Counsel” (currently, Don McGahn). The longtime Arizona lawmaker has been involved in “helping follow up on questions, etc” after their meetings with Senators. “I believe he has done a very good job in his ‘interviews’.”Democratic Senators on the Judiciary Committee are protesting last week’s decision by the White House to assert executive privilege on some 100,000 pages of documents from Kavanaugh’s record while he worked for the Bush Administration. * They are insisting that documents currently marked “Committee Confidential” be publicly released in order to question the nominee about them. Jeff Flake, Kyl’s replacement in the Senate, is on the Senate Judiciary Committee and will be participating in the hearing that starts tomorrow. He has not released any public statements on the Supreme Court nominee since shortly after President Trump named him. He is well prepared to bob and weave on anything of substance, and smile and obfuscate on everything else. 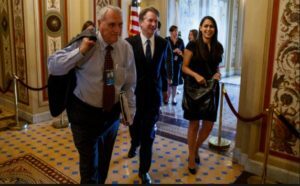 One repub senator will say how well he dresses and how cute his family is, and how well qualified he is to gut various parts of the constitution.